Gladys Tordil. Santa Lizama. Tarekka Jones. NeShante Davis. All of these women were killed by men who once loved them, Prince George's County police say. UpdatedMan Charged With Fatally Stabbing Woman in Md. But a new report by the Prince George's County Domestic Violence Fatality Review Team says their deaths may have been preventable. The team believes identifying the "red flags" that often precede domestic violence murders and murder-suicides could help others intervene before lives are lost. 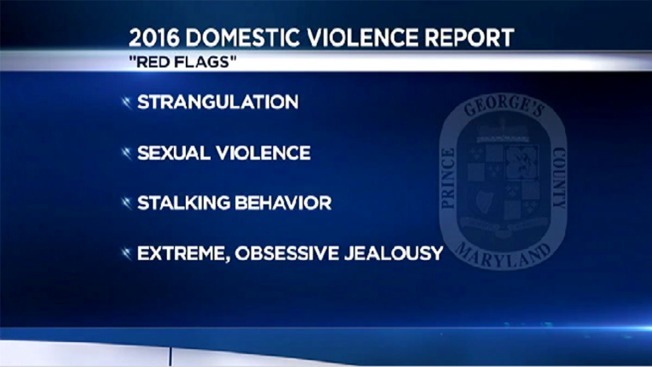 The red flags include: strangulation, sexual violence, possession of a gun, unemployment of the abuser, abuse of drugs and/or alcohol by the abuser, stalking behavior and prior attempts by the victim to leave the relationship. Previous abuse by the suspect is the strongest of these "red flags"; 72% of victims murdered by their partners were previously abused by those partners. The team believes teaching the community about the red flags and providing resources to victims of domestic violence could help quell the shocking number of domestic violence murders and murder-suicides in the county. 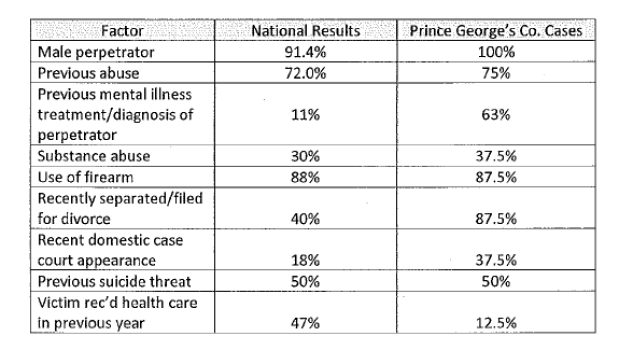 Between January 2009 and December 2014, 16 percent of homicides in Prince George's County were attributed to domestic violence, making the county number one in the state for such crimes. The county's domestic violence issue has been highlighted in several high-profile cases, including a shooting spree that crossed into Montgomery County earlier this month. Gladys Tordil was fatally shot by her estranged husband, 62-year-old Eulalio Tordil, as she sat in her car in the parking lot of High Point High school, police say. The District Court of Maryland for Prince George's County ordered Eulalio Tordil in March to stay away from his wife, her home, her workplace and High Point High School, court documents show. Gladys Tordil told the court Eulalio Tordil beat her and physically abused her two children. In 2010, he slapped her so hard her glasses broke on her face, she told the court. She had filed for divorce, court documents say. Gladys Tordil's story is similar to many victims of domestic violence in Prince George's County. Nearly 88 percent of domestic violence murders in the county were preceded by a separation while 37.5 percent followed a hearing for custody, child support or a protective order. Earlier this year, NeShante Davis and her daughter, Chloe, were killed outside their Fort Washington, Maryland, apartment after Chloe's father, Daron Boswell-Johnson, demanded Davis drop her ongoing child support order, court documents say. The Prince George's County Domestic Violence Fatality Review Team says the community must "make the time and financial commitment" to turn these horrific statistics into a solution. Those in the legal and mental health field must be educated on the "red flags" and use that knowledge in every decision-making moment that affects victims of domestic violence and their perpetrators. The team also recommended that all of the county's service provider websites and social networking sites prominently feature the list of predictors. You can find more services and programs for individuals affected by domestic violence here. For free counseling and therapy, visit probonocounseling.org. And for My Sister's Place, which offers shelter in a safe house, click here or call 202-749-8000.